Taking it one dune at a time. The visibility was not good. Taken by Ulrike. The tarmac ends abruptly a few kilometres south of Douz, the road continues, but there is a clear line when it turns from black-top to dirt track. From here to Ksar Ghilane, about 150 kilometres drive to the south east, the surface changes many more times; fast-driving hard-packed sand, corrugated shake-the-truck-to-bits sand, smooth rock-bed, gravel with fist-sized sharp rocks mixed in that could slice a tyre like gutting a fish, soft tyre-sucking sand and dunes. You see them in the distance, running straight across the horizon like the looming first day back at school when there’s only a week left of the summer holidays, like a tax submission when you’ve spunked all you’ve earnt and got no savings. Of course, you have a naïve assumption that the track must snake through. This pathetic belief quickly dissolves as you approach. No matter how your eyes scour you can’t see where the path might go. Then you realise, or rather accept the truth, that there is no track. It stops where they start. I slump forward onto the wheel for a few seconds to stare out of the window, then jump out and walk ahead, scouting a path with Mirko, and grateful, not for the last time, that we’ve been sensible and listened to the maxim, “Never drive alone in the desert”. He is driving dunes for the first time too. He’s ridden thousands of kilometres over the Sahara on a motorbike, but this time he is in a Land Rover 110 with his wife Ulrike. It’s all very different on four wheels than two. We are both about to drive into the unknown. Walking ahead only serves to confirm one thing: you have to pick your own route. Get it right and you get through, get it wrong and at best it will be a few hours of digging sand under a searing sun. The only way to do this is to drive. Let some air out of the tyres to give them a bigger footprint, engage the diff lock, selected low second and pull off. Straight up and over. Hit that dune anything other than square on and four tonnes of truck has a very good chance of rolling. Not a pleasant thought, especially way out here. Especially when what will roll over is your home. That first dune wasn’t the biggest we would climb that day, or the next: it was quite small really, maybe only a meter and a half tall. I could see over the top of it from the driving seat, but it looked like a mountain. We only had a few meters run-up from a standing start and I probably stepped on the throttle harder than I needed to because we shot up and over like it was nothing but a speed-bump on a suburban street. We came down pretty hard on the other side. But it showed me once again just how capable the truck is. Like a blubbery sea lion that waddles on land, but is sublime in the water, the 101 danced through the Sahara. Five and half thousand kilometres bouncing, trundling and labouring along on tarmac had numbed me to its staggering off-road agility and power. It was amazing when we took it wading in the winter mud of East Anglia, just as impressive in Sahara sand. It climbed dunes effortlessly. From a standing start and without over-gunning the throttle, it would stroll up slopes that seemed near vertical sat in the cab. Some of them were at least five metres: enough to give me a psychotic grin and a junkie’s desire for more, but nowhere near the limit for the truck. She seemed disappointed when she reached the top. This junkie has a new poison. Booting the accelerator and charging straight at a wall of sand in four tonnes of truck is a little unnerving. 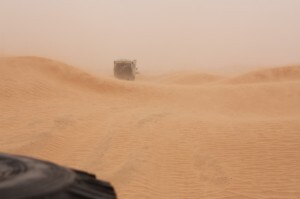 Do it once and the trepidation turns into a manic obsession to tear up each and every sand hill in the entire Sahara. Sell the house. Sell everything in it. Arrange an airdrop of spare parts, beer and petrol and stay out here driving up and down dunes until the tyres melt or sanity snaps. This is fun. Oh, yes. My god. This is fun. With a hymn from “Faithless” blasting out of the stereo loud enough to overpower the scream of a V8 in an aural battle of satainc proportions, this is my church. This is where I heal my hurt.